The Jewish creators of the Comedy Central series “Drawn Together” have a message about a perceived affront to Israel in an Internet game based on their equal-offender series: Watch the movie before casting judgment. Cable network Comedy Central drew fire from Israel activists because of its Website game “I.S.R.A.E.L. Attack!” – later changed to “Drawn Together: The Movie: The Game” – based on the “Drawn Together” animated reality TV series and movie. Media watchdogs such as Honest Reporting interpreted the character Intelligent Smart Robot Animation Eraser Lady – I.S.R.A.E.L. – as a slander against the Jewish state. Matt Silverstein and Dave Jeser are the Bergen County natives behind the Comedy Central series “Drawn Together,” which sparked outrage over the Website game “I.S.R.A.E.L. Attacks!” based on the show. “Drawn Together” places parodies of video game and cartoon stereotypes together in a house Ã la “Big Brother.” The series ran four years on Comedy Central before cancellation. After that, Dave Jeser, originally from New Milford, and Matt Silverstein, originally from Oradell, created “Drawn Together: The Movie,” which featured a fictional network out to erase the reality show characters with the I.S.R.A.E.L. robot. “It’s less a comment on Israel and the world than a comment on the silliness and stupidness of the characters on the show and their unwarranted fears of the unknown,” Jeser said. Honest Reporting in particular lashed out at the game, alleging that the I.S.R.A.E.L. robot “plays on an association of Israel as a child killer.” The group also castigated Comedy Central for the character Jew Producer, the executive who runs the reality show and has a loudspeaker for a head. The “Drawn Together” incident comes just weeks after Comedy Central censored the image and name of Mohammad on two episodes of “South Park.” This led to accusations from Honest Reporting of double standards at Comedy Central toward Muslims and Jews. Jeser and his partner supported “South Park” creators Matt Stone and Trey Parker but understood Comedy Central’s dilemma in trying to protect its employees. 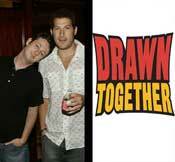 This isn’t the first time “Drawn Together” rubbed some people the wrong way. One episode upset a number of Asian advocacy groups because the Pokemon parody Ling-Ling tried to get his driver’s license and turned out to be a horrible driver.